The bottle of domesticated beer is an artifact found in Godville. 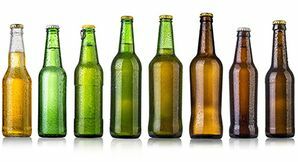 The beer itself is golden-yellow in color, but the bottles themselves may be clear, green, or brown. They are distinguished from other beers by being in bottles (as opposed to cans, kegs, steins, mugs, stomachs, or toilets), and by being far less wild than their non-domesticated brethren. In days of yore, when the world was young and times were simpler, herd of wild beer thundered across the Low Gravity Plains. With no natural predators at this point, the wild beer population grew larger and larger. It was not until the First Heroes and Heroines emerged onto the scene that this blissful state became threatened. At first, these were beer-hunting-and-gathering tribes of adventurers. After several centuries, even some of the less-dim heroes and heroines started to wonder if there was an easier way to have a ready supply of beer on hand, without need of either hunting nor gathering. It was further postulated that, much as some monsters had been captured and trained as pets, perhaps the wild, free-roaming beer could be rounded up, broken, and taught to become dependent on the heroes and heroines. Surprisingly, this did have some limited success. And, thus, the first beer was domesticated. Quickly, though, it was realized that the normal methods of fencing, pens, and barbed wire did not prevent the domesticated beer from sometimes escaping (often into the stomachs of other heroes and heroines). First attempts at placing the domesticated beer into cardboard boxes, envelopes, and cupped hands proved to be woefully ineffective. It was only after these many setbacks that the glass bottle was first tried. This met with fairly limited success until the invention of the bottle cap by famous inventor Sir Bartholomew Bottlecap. With the new caps securely affixed to the tops of the glass bottles, the bottle of domesticated beer was officially born. ↑ Not "lager and lager". ↑ Considering the low intelligence of the domesticators viz-à-viz the domesticated. ↑ Remember to stop and breathe periodically. This page was last edited on 11 January 2019, at 11:29.